sana is using Smore newsletters to spread the word online. Are you interested in the workings of the United Nations and world affairs? The MUN (Model United Nations) club engages in an authentic simulation of the United Nations system by learning about the UN system, the skills of debate, compromise, conflict resolution and negotiation. 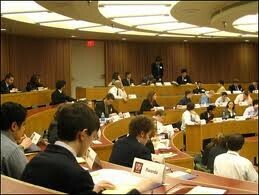 MUN team members have fun learning about the workings of world diplomacy through the lens of current events."